Three years ago, Volkswagen AG was in the depths of scandal because it lied about the emissions of its diesel cars. As 2019 begins, it has emerged as the most disruptive player in the business of selling a different kind of fuel: the electrons that move electric cars. This is a direct result of its diesel cheating. Ordered by U.S. and California officials to build a $2 billion profit-seeking business in electric vehicle fueling stations, it has done so with aplomb. The subsidiary it created, Electrify America LLC, is now the richest and most talked-about company in the making of roadside chargers. Its influence will be profound if millions of Americans switch from gasoline to electric drivetrains. Electrify America and its money are like a gravitational force. Almost overnight, the Reston, Va.-based VW unit has turned its suppliers into market leaders. It has upended the business plans of longer-established charging companies, and set high and expensive new standards for crucial parts of the EV ecosystem. 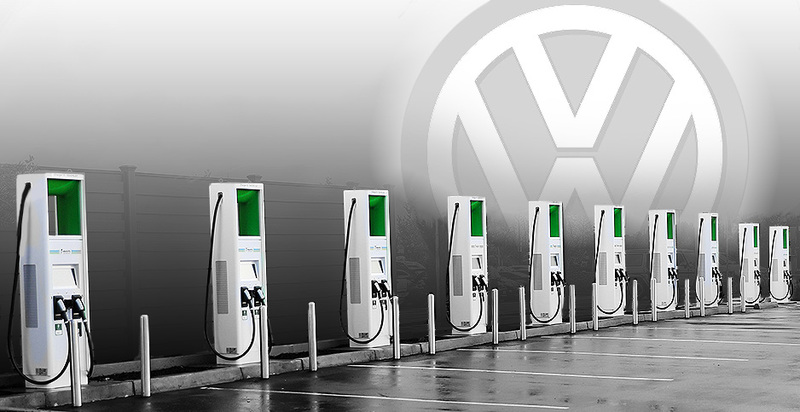 The VW subsidiary says it is making charging faster and more accessible, just like regulators asked. But its rivals see something else: a ruthless competitor that is magnanimous in public but can be underhanded in private. Those firms, with far smaller budgets, say that Electrify America's flood of money is warping the market in ways that might slow down the adoption of EVs and make the fuel more expensive. They say they don't have the resources to compete with a corporate giant that is compelled to spend tens of millions of dollars per quarter. They say Electrify America is using its heft to steal business out from under them, and wonder how much of its charging network is for the common good and how much is tailor-made for VW's future stable of electric cars. "With their big wallets and big promises, they have actually gone to our customers and pulled our hardware out of the ground and replaced it with theirs," said Michael Farkas, the CEO of Blink Charging Co., a competitor, making an allegation that Electrify America denies. "Doing that is not the most honorable thing, and it doesn't help the marketplace." At the LA Auto Show in November, leaders of the auto industry leaned forward in their chairs to hear a presentation by Electrify America's CEO, Giovanni Palazzo. He didn't mention the pollution scandal that led to his presence there. He scarcely uttered the word Volkswagen. "Let me tell you that I hope you got, and the message came through today, what Electrify America is willing to do," he said. "We see we are contributing to a better future — greener, more sustainable, more conscious." Electrify America, with its parentage and large purse, has become EV-charging royalty with powerful allies. It has the blessing of the Sierra Club and many utilities, which welcome the investment in charging networks that could unseat gasoline, increase demand for electricity and reduce the threat of climate change. It even gets kind words from its most rigorous regulator, the California Air Resources Board (CARB), which uncovered Volkswagen's diesel cheating in the first place. 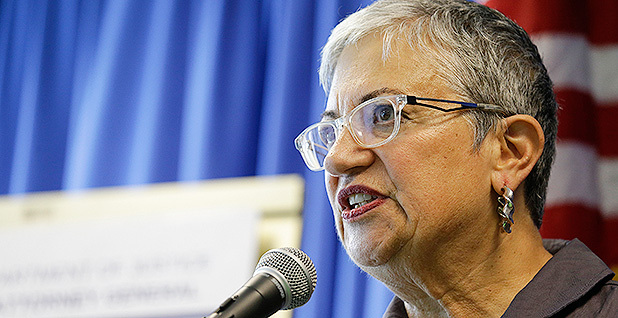 "I think from the beginning, Electrify America has done in good faith what it said they were going to do, which is spend a lot of money, more money than anyone has ever spent, in all the years we've been trying to get infrastructure developed, to build a network of public charging stations that will enable an electricity market," said Mary Nichols, the chairwoman of CARB, in an interview at the LA Auto Show. "They deserve our thanks and our support for what they're doing, even if it took catching them in a violation to get this commitment done." In private, Electrify America's competitors speculate about political undercurrents driving California regulators' light handling of Electrify America lately. The VW consent decree, which President Obama's Justice Department celebrated as a major achievement, is now being enforced by the Trump administration. In theory, some suggest, a White House that champions fossil fuels and takes a dim view of electric cars could agree to renegotiate the terms that dictate VW's $2 billion of spending. And that could wipe out the windfall of dollars to build out EV infrastructure. The legal settlement that created Electrify America also resolved most of VW's troubles in the United States. But abroad, the diesel scandal and the corporate behavior that enabled it continues to burn. Volkswagen is fighting lawsuits around the globe, and the company and its current and former executives face multiple civil and criminal investigations in Europe and in its home country of Germany. Volkswagen's management boards, which oversee its executives, still deny they knew about the sophisticated, worldwide effort to cheat on diesel emissions, and most of those board members remain in place. It is unclear whether Volkswagen's top-down, win-at-all-costs culture has really changed. Since the scandal, a related and equally astonishing turnaround has happened at Volkswagen: The company has abandoned diesel and gasoline and bet the farm on electric cars. At the LA Auto Show, Volkswagen Group of America CEO Scott Keogh announced the company would spend $38 billion worldwide on electric drivetrains in the next four years, far more than any other global automaker. By 2025, it plans to have 50 fully electric models. By 2026, it expects to launch its last gas-powered car. The experts can't recall anything quite like Electrify America, a multibillion-dollar combination of regulatory zeal and corporate ambition. The seed was sprung from VW's systematic deceit. For seven years, starting in 2009, VW marketed its "clean diesel" vehicles as a zippy alternative to hybrid-electric cars like the Toyota Prius. It achieved that performance by embedding a "defeat device" that helped the cars meet emissions tests in the lab. On the road, however, they would produce up to 40 times the allowed limit of nitrous oxide, which contributes to smog and harms human health. The fraud was uncovered by an investigation by CARB, the California air regulator, in 2015. The legal dominoes fell through a federal courtroom in San Francisco. Squads of lawyers representing car owners, auto dealers, the Justice Department, EPA and CARB sought to recover damages from the automaker. A special master — a certain former FBI chief named Robert Mueller — oversaw the negotiations. And in late 2016, the parties signed a consent decree that assigned VW almost $16 billion in penalties, most of which was to buy back the polluting cars or compensate for the pollution they'd spewed. One part of the decree was unusual. Called Appendix C, it apportioned $2 billion to "Investments in ZEV Market Support." Volkswagen was required to spend that amount over a decade to facilitate zero-emission vehicles. Of that, $800 million would be spent in California, and $1.2 billion in the rest of the country. Put simply, the consent decree directed the world's largest automaker to create a business around EV charging — spending $500 million of its own money every 2 ½ years, ending in 2027. Corporate wrongdoers aren't often asked to inject large amounts of money into a market adjacent to their own, like forcing a car company to invest in fueling. "It's pretty unusual for the regulator to force entry," said Craig Falls, an antitrust attorney at the firm partner in the firm Dechert LLP. "Often they force you to leave." But the VW settlement — larger by a factor of 20 — turned the money tap to a flood. By point of comparison, the $500 million that VW is compelled to spend every 30 months is almost equal to the $532 million that ChargePoint Inc., one of the industry's giants, has raised in its decade of existence. VW can't spend however it wants. Strings are attached, especially in California, where CARB retains a veto and oversight has been more muscular than at EPA. Charging investments have to be "brand-neutral," usable by every kind of electric car and not specifically designed to help Volkswagen. CARB sought not scattershot spending, but "transformative outcomes." It required that 35 percent go to infrastructure in poor and disadvantaged communities, while another hefty chunk goes toward advertising to raise EV awareness. Lastly, according to CARB's instructions, VW's spending has to "not interfere with or undermine established and emerging businesses in the market place." CARB attached other conditions designed to make charging work better — provisos that are now creating headaches for Electrify America's competitors. Today's EV drivers usually pay for electrons through a company membership; CARB requested that Electrify America offer credit card payment, like gas stations do. Charging stations can take hours to charge a vehicle; CARB asked for faster chargers. In California, some underused stations have been abandoned; CARB asked VW to provide a full decade of maintenance, with live operators standing by. These changes make fueling an EV more pleasant. But they are also expensive to implement and are hard to afford for builders not backed by VW's deep pockets. CARB is making no apologies. "We know what we get with Electrify America," said Analisa Bevan, an assistant division chief at CARB who oversees the investment. "We get chargers that consumers can use. It is one of many networks within the state, but knowing that we've got that consistent investment over the 10 years, and we know that it's going to be maintained over those 10 years, because that's required in the consent decree, that it will be open access to all users, all of those elements are critical to demonstrating what we want to see in California." With German efficiency, VW did what it was told. In February 2017, five months after a judge signed a partial consent decree directing $2 billion in EV spending, Volkswagen announced its new subsidiary, Electrify America. It would be led by Mark McNabb, a former chief operating officer of Volkswagen Group of America and veteran executive of other automakers, including Nissan, where he had helped roll out the electric Leaf. Giovanni Palazzo. Volkswagen Group of America Inc.
Electrify America rented an office in Reston, in the orbit of Washington, D.C., and hired an experienced team at top salaries. "I have BMW. We have Toyota. We have people from different EV infrastructure companies. EVGo, Greenlots. We have government officials. We have people who came from the Department of Energy," McNabb told CARB at a hearing in July 2017. To negotiate with the utilities that provide the electricity — almost 200 of them — it created a three-person crew of experts. To lobby in Washington, it hired Matthew Nelson, who was chief of staff of the U.S. Department of Energy's Office of Energy Efficiency and Renewable Energy under President Obama, and Patricia Readinger, a former legislative aide at the U.S. Department of Transportation. It also brought on Sophie Shulman, a former deputy chief of staff at Obama's Domestic Policy Council, as its manager of partnerships. It would be, in the words of Palazzo, "one of the largest, most technologically advanced and customer-friendly charging networks in the U.S." And with its money, corporate backing and its tight deadlines, it rose to the status of major industry player overnight. The company inked deals at a scale that were the envy of competitors who had been in the business for years. It landed a contract to build at 100 Walmarts. It signed on with major real estate investment trusts such as AvalonBay Communities Inc., which is installing 80 stations at apartment buildings it owns. Overall, more than 80 percent of Electrify America's stations are coming through partnerships with big companies, said Brendan Jones, chief operating officer of Electrify America. Electrify America's money was a magnet for metropolitan areas that wanted to win its investments. "States and metros have been clamoring, come here, come here, come here," said Max Baumhefner, an attorney at the Natural Resources Defense Council. In the end, Electrify America named 17 metros as its focus points across the country, from Los Angeles to D.C. to Boston to Houston. For struggling makers of EV-fueling equipment, Electrify America became a windfall of dazzling proportions. It hired four suppliers to build its charging stations, immediately becoming one of last year's biggest buyers of hardware. One was BTCPower, a small Southern California firm. "We're going from a job shop to a scaled manufacturer," said Terry O'Day, the chief strategy officer at Innogy SE, a German firm that bought BTCPower in July because of its new influx of business. "It is the large Electrify America orders that have propelled that." The jolt of business from Electrify America enabled it to build a factory in the Philippines to supply the U.S. market. Another is SemaConnect, a Maryland installer that was a minor player until Electrify America tapped it as the master contractor for about 1,500 stations across the country. "This award has required us to beef up internally, to staff up. Every week it seems we're bringing on new employees to support the different phases of the Electrify America award," said Josh Cohen, the company's director of policy and utility programs. Electrify America built all of this in about 18 months. "The amount they were able to do in just one year was herculean," said Quincy Holloway, a former Electrify America project development manager who left the company in mid-2018. "A lot of companies who weren't operating with that capital thought they were operating at a disadvantage. But none of those companies had the Air Resources Board breathing down their necks." The hardest part has been figuring out where to put the fueling stations. "I cannot say it's a mess, because it's not nice," said Palazzo to the crowd at the LA Auto Show in his heavy Italian accent. "So let's say it's a challenge." It might seem an easy thing to place a plug. But instead, Electrify America and its competitors are often in hand-to-hand combat over a few coveted locations — raising costs and maybe slowing, rather than accelerating, the growth of charging networks. Driving the controversy is Electrify America's urgent deadlines. Essentially, it has promised regulators to build not one but two major EV networks by June. The company, like its rivals, can only make money if it focuses on where the EVs actually are, or soon will be. That means early-adopter cities and on major interstates. For the first of those, in its 17 big metros, Electrify America is making a web of lower-powered chargers, called Level 2. Electrify America has budgeted $85 million to build 650 of them. Unlike gas stations, which have their own real estate, chargers usually occupy a few parking slots at a parking lot. In addition to a willing parking lot owner, Electrify America needs good lighting and a convenient location, and a local grid strong enough to accommodate the electricity demand. And getting permits takes time. The amount they were able to do in just one year was herculean. The obstacles are also daunting on interstate highways, where Electrify America is building a $265 million network of fast-charging stations to rival Tesla's. Interstates may seem endless, but parking lots with the necessary electrical connections are few. Electrify America is trying to build 300 fast-charging stations in 39 states at intervals of about 70 miles by summer — far faster than anyone has tried to build before. As a result, when Electrify America picks a site, its competitors are often already there. 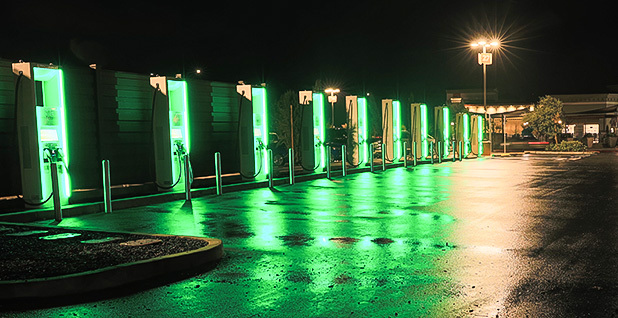 At one of its newest locations at an outlet mall in the Northern California city of Livermore, Electrify America's fast-charging plaza joins three fast-charging plazas, one belonging to Tesla and two others belonging to EVgo. "If you put one where there's already chargers, you're not expanding the usefulness," said Jonathan Levy, the vice president of strategic initiatives at EVgo. "Instead, you're cannibalizing the business of someone else and not making a service available for new drivers." As Electrify America prepared to unleash its second, $200 million cycle of funding in California, its leading competitors — EVgo and ChargePoint — accused it of a "land grab" (Energywire, Nov. 5, 2018). EVgo, which is the leading builder of EV fast-fueling stations, told CARB that Electrify America's gold-plated contract for site hosts — free installation, maintenance for 10 years and generous rent — has raised costs for all installers. Because of Electrify America's largesse, it said, parking lot owners now expect rent payments. "One key area has been a marked shift in how, for example, grocery stores have switched from seeing the value of charging as an amenity to increase foot traffic into their stores to now expecting hundreds of dollars of rent per charger for [a] month," the company's director of market development, Sara Rafalson, said in a letter to CARB. EVgo also accused Electrify America of paying site hosts to break its contracts under a highway charger rollout funded by a sister agency of CARB, the California Energy Commission. 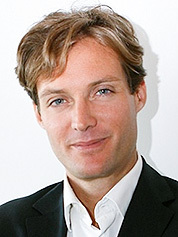 Jones, the chief operating officer of Electrify America, disputes that claim. "There's no example where we've ripped and replaced someone else's charger. We don't do it as policy," he said, allowing the possibility that contractors had made such offers. "Once it gets to my desk, and I find out about it, it's disengagement." For all the controversy that Electrify America has created, it's only getting started. For its second phase in California, it wants to install 3,400 new charging stations and spend the bulk of its funds — up to $115 million — on fast charging in cities, where the action is these days. It will spend up to $30 million on new highway routes. It also plans incursions into fresh corners of the EV-fueling world, including homes (up to $12 million), buses and shuttles ($6 million), rural areas ($2 million), automated vehicles ($4 million), and renewable generation alongside its charging stations ($5 million). CARB, the California regulator, approved Electrify America's plan. It's all hard to swallow for Electrify America's competitors, who continue to claim their well-heeled rival is swiping customers from under their noses. Marc Aprea, a contractor arguing ChargePoint's case before CARB a few weeks ago, put it this way. "When you are the world's largest auto manufacturer," he said wearily, "your world looks very different than it does at a startup company." While Electrify America is mandated by regulators to serve all vehicles, some competitors have grown uneasy with the ways in which Electrify America could jigger its network to give an unfair advantage to its parent, Volkswagen. One involves the sort of chargers that Electrify America is building. Today, most fast chargers in the United States deliver 50 kilowatts of electrical power. One of the first announcements that Electrify America made was of far more powerful stations, between 150 and 350 kW. No EV on the road today can accept that much power. Even the supercharging network of Tesla Inc., which makes the fastest EVs, max out at only 135 kW. Electrify America says it is "future-proofing" its stations, and it has a point: An EV can fill its battery almost seven times faster at a 350-kW charger than a 50-kW one. Once cars are built to handle this much juice, an electric car might fill up as quickly as Americans expect at a gas station. This upgrade comes at great expense to Electrify America. With no such high-powered chargers on the market, it commissioned its suppliers to engineer them, including new liquid-cooled cables to manage their enormous heat. Why is super-fast charging so important to Electrify America? "If anyone tried to create a financial model for DC [direct current] fast charging, it doesn't make sense today from a financial perspective," said Farkas, the CEO of rival network Blink. "It doesn't make sense for anyone except someone who's selling a car." Among established automakers who are developing EVs that can accept super-fast power levels, about half are being built by VW and its brands Audi and Porsche. One of the words that Electrify America often uses to describe itself is "premium." A critical part of its business model, one to distinguish it from rivals, is that it will partner with automakers and offer drivers special access to its super-fast network. The first such partnership, announced in September, was with Audi. Drivers of the new Audi's e-tron, the first of Volkswagen's new wave of EVs, will get 1,000 free kilowatt-hours of charging on Electrify America's network. Electrify America says that negotiations with Audi — a sister division of the same company — were as hard-nosed as they come and that other partnerships with outside automakers are coming soon. "The Audi deal was simply the hardest deal ever," said Jones, laughing at the thought of it. "It was very much a negotiation between a vendor and an OEM [original equipment manufacturer] and the pretenses of having a connection to the company did not give us any favor in any way, shape or form." Jones says that Electrify America holds itself at arm's-length from the parent that created and funds it. Communication between the two happens mostly through Palazzo, the CEO, he said, though others like Jones occasionally find themselves in the room. Questions persist about the extent to which Volkswagen is building a network to benefit itself. Doubts also exist about whether VW's statements can be trusted, given that the company's most senior leaders still deny that they knew of the yearslong, sophisticated effort to deceive regulators before the diesel scandal broke. One worry belongs to General Motors Co., which is developing its own fleet of EVs. Electrify America has catalyzed all of this change and controversy in less than two years, with just the first $500 million required by regulators. It will keep spending through 2027, with another $1.5 billion to go. 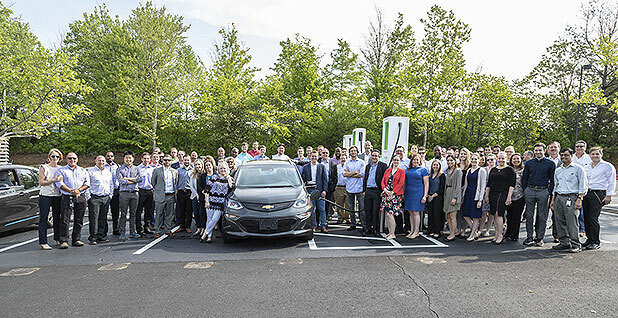 If Electrify America can figure out how to make money with thousands of electric chargers in the United States — and its 32 new stations it is building unasked in Canada — executives talk of expanding to Europe. Meanwhile, Volkswagen the automaker is leading a $38 billion global transition to electric cars. Should it succeed at both, it's possible that a diesel-tainted past will transform Volkswagen into an auto company unlike any the world has ever seen, a major carmaker crossed with a Chevron, a colossus that builds the EVs of the 21st century while also selling the fuel to make them go.